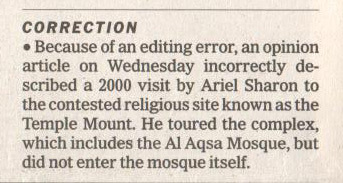 The New York Times has printed a correction for one out of two errors in Ali Jarbawi’s Jan. 22, 2014 Op-Ed on Ariel Sharon (“The man who made peace impossible“). Israel does not retain absolute control over Gaza’s land borders. Egypt controls its border with Gaza along Rafah; Israel has no control there. Text on a map with a Dec. 4 Page One article about Israel’s use of drone aircraft incorrectly said that Israel controls all border crossings with Gaza. It controls the crossings between Gaza and Israel but not the Rafah crossing between Gaza and Egypt. Israel built a wall around Palestine and recently completed a fence along its Egyptian border. While it is unclear exactly territory Di Cintio has in mind when he writes “Palestine” — does this mean the West Bank, the West Bank and Gaza, Palestinian controlled territory in the West Bank? — he is incorrect regardless. With respect to the Gaza Strip, a fence, not a wall, separates Israel from Gaza. In her Jan. 3, 2014 article, for instance, The Times’ Isabel Kershner correctly refers to the Gaza “border fence” repeatedly. According to Dany Tirza, who was the IDF’s chief architect for the barrier, “less than 5% percent of the project is a concrete wall” (Al Monitor, July 1, 2012). Most of the barrier is made up of a wire fence flanked by barbed wire, a trench and patrol roads. In some urban areas, particularly around Jerusalem, it takes the form of a looming concrete wall. Fact-check the article. While it is the author’s responsibility to ensure that everything written for us is accurate, we still check facts — names, dates, places, quotations. are obviously required to be factually accurate. If one of them makes an error, he or she is expected to promptly correct it in the column. (Cited in “The Priviliges of Opion, the Obligations of Fact,” Daniel Okrent, March 28, 2004).